One of the applications we can draw from the Christmas story is that things are not always as bad as they seem. Joseph and Mary were a young, engaged couple. This carries the idea of hope, promise, dreams and potential. But before they ever came together physically, Joseph discovered that Mary was pregnant. Joseph knew that he was not the father of her child. This was, no doubt, devastating news for Joseph. In his mind, the young woman with whom he had planned a future had been unfaithful to him. This was a deal-breaker for Joseph. These types of discoveries force one to make some decisions. Joseph’s decision was to secretly end his engagement. Although Joseph was not aware of it, God was behind the discovery he had made. The Child Mary was carrying had been conceived by the Holy Spirit. God is often working behind the scenes in our personal situations, and we do not realize it. But after the discovery and the decision, Joseph received some direction from an angel – a messenger from God. The angel told Joseph to proceed with his plans to marry his fiancee. Even though Joseph’s fear and reservation were justified, the angel assured him that he could stop being fearful, because this was all a part of God’s plan. The thing that Joseph thought was the worst that could have happened, turned out to be the best thing that could have occurred. The Savior that the world had been awaiting was going to be born in his household. 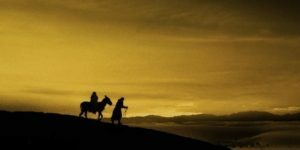 Joseph was planning to get rid of Mary and what (who) he really needed the most – Jesus. Joseph’s deliverance was closer than he understood. Just as things were not as bad as they initially seemed to Joseph, your current circumstance is probably not the end for you. Maybe you started out with great hope, potential and promise, but you discovered something that threatens your dreams. You have made the decision to get rid of something that is ultimately what you need. Don’t make the mistake that Joseph almost did. The situation that you thought would destroy your dreams could actually be orchestrated by God to bring relief. What you thought was the worst may actually be one of the best things that could ever happen to you. Like the angel told Joseph, don’t be afraid to pursue your dreams!